I absolutely love mango! This smoothie is mostly mango with a nice pineapple-orange kick to it. Enjoy! For this smoothie you’ll need fresh or frozen: mango chunks, pineapple, and peach slices, as well as some spinach, a small piece of ripe banana, orange juice, and Bolthouse or Arthur’s mango juice. I use the PC 4 fruit frozen mix for this smoothie, which includes mango, pineapple, peach, and (also) strawberry. I throw in a few extra mango chunks and add varied amounts of mango and orange juice (generally more OJ than mango juice) until the ingredients are just about covered, then add water to whatever level is needed for blending. A handful of spinach and 1/4-1/3 of a ripe banana completes this tasty green drink! 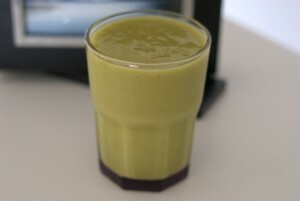 This entry was tagged Arthur's, banana, Bolthouse, green, mango, orange juice, peach, pineapple, smoothie, spinach. Bookmark the permalink.